I’ve officially been travelling for 2 weeks – how did that happen! 2 weeks to go! So far we have seen Dubai, Bangkok and are in Koh Samui now. We leave for Sydney on Saturday and then go to LA and end in Las Vegas! So far this trip has been incredible, we have seen so much and been able to finally celebrate that we both got our degrees! I plan to post about my trip when I get home as I quickly realised when I got to Dubai I didn’t want to be on my phone typing up my experiences and not living them! However, and I’ll show it properly when I get back, I’ve been writing in a little diary small entries about each day so I won’t be forgetting anything and I’ve loved doing that! 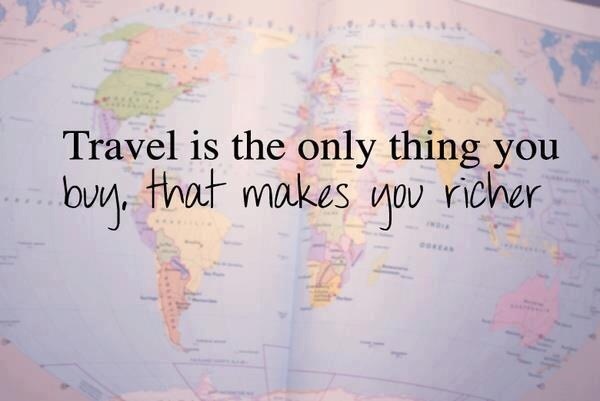 So for now, I leave you with a travelling cliche quote! True and cheesy – I adore that! Enjoy the rest of your summer guys! Hope you’ve a great trip! Can’t wait to read about it!